﻿ Wina Holiday Villa Hotel, Bali | FROM $19 - SAVE ON AGODA! 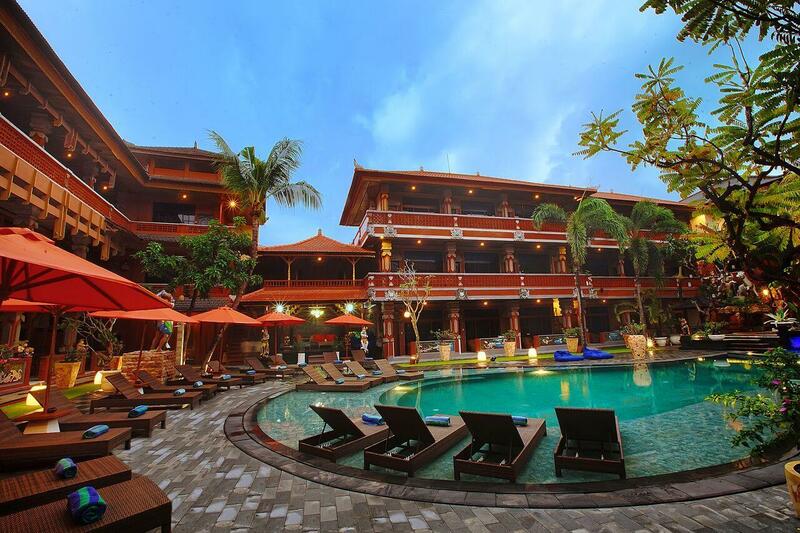 "I will continue you to stay at the Wina hotel"
Have a question for Wina Holiday Villa Hotel? "We love the staff location and pool areas ." "Value for money, excellent location." "Good food, nice location and very clean"
The Wina Holiday Villa Hotel is a great choice for the ultimate vacation. 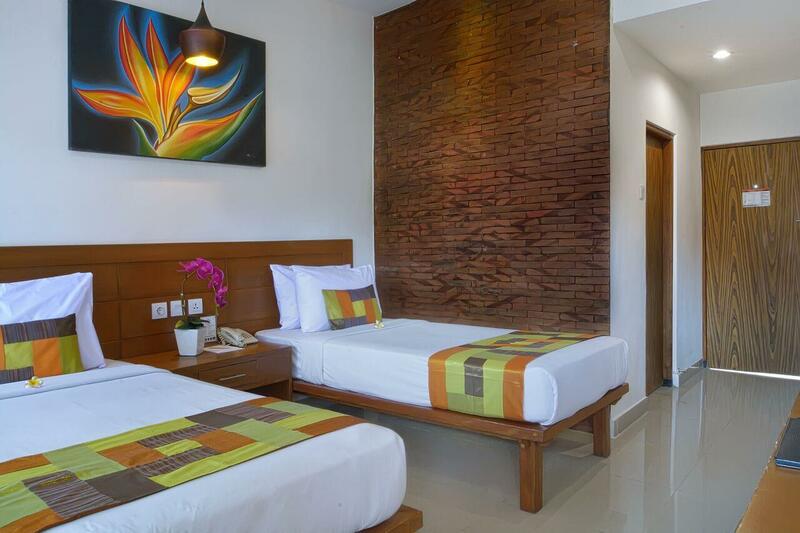 This hotel is near Beachwalk Shopping Center Kuta, Beachwalk Shopping Center, Manalagi Sango, Beer&Co., and Universo Legian. It has a fitness center, a garden, a spa, and a hot tub among other great facilities. With a convenience store, an infirmary, safety deposit boxes, a currency exchange, and a laundromat, the Wina Holiday Villa Hotel provides an assortment of convenient features to make your stay more comfortable. The Wina Holiday Villa Hotel offers a bar, a poolside bar, room service, a coffee shop, and restaurants on-site, so there is a selection of dining and snacking options. With Indonesian, American, and Asian restaurants nearby, you can dine out at delicious restaurants and discover new cuisines. Some of the nearby restaurants are Warong Miyabi, Caviar Cafe, and Tony Roma's. If you want to spend the day relaxing and unwinding, visit the nearby massage facilities. With guided tours available, the Wina Holiday Villa Hotel is a great spot to stay to learn about the area. This hotel has an assortment of transportation options that include airport transfers, bicycle rentals, and shuttle services. It provides a number of useful services, which include a concierge, luggage storage, a babysitting service, daily housekeeping, as well as laundry services. The Wina Holiday Villa Hotel provides an express check in and check out service, allowing you to avoid the frustration of waiting in long queues when preparing to catch a train or plane home. The front desk is open around the clock, ensuring that there is always a member of staff behind the desk to assist you with any queries. There's free Wi-Fi available in all rooms, as well as Wi-Fi in common areas, so visitors won't have to worry about buying a local sim card. Check-in is offered from 02:00 PM and check-out is until 12:00 PM. This hotel permits pets, so you can take your dog or other pet on a fun-filled getaway. It is equipped with a playground, keeping your kids happy and entertained all day long. Featuring a kids club, this hotel offers parents a fun-filled and safe childcare option. It is also equipped with a kids swimming pool to keep your children busy throughout your time away. The nearest airports are Ngurah Rai International Airport (DPS) and Lombok International Airport (LOP), which are situated 3.9 km and 120.2 km away. "The site is amazing, there are 3 full sized pools and the ga..."
The hotel is a bit underpriced compared to other hotels in the area. 3 pools, kid's playground, new building with new rooms and pool. Very beautiful hotel decorations and very friendly staff. We had some issues in the room and they were fixed very fast. Right smack in Kuta one would expect it to be noisy. However, it is located just a little off the main road. Hence you still get access to the happenings in Kuta and yet be out of reach the noise. Convenient and adjacent to the modern shopping mall. Halal food in the hotel restaurant and easy access to other halal eateries outside the hotel. Three nice pools available for guests. I was on my honeymoon trip and the resort staff gave us a specially decorated room. The staff was well supportive and attended to all our requests. Only con i could say was the cooling in the room was less because the a/c was not cooling the room fast enough. But rest all was awesome. I will definitely be coming back here. Although it is mentioned to be at Jalan Raya Pantai Kuta, but actually the location is entering a small pathway... only just 100 m... no big deal.. So, we can walk to the beach and the Beachwalk Mall to have meals and enjoying our time. A Lovely hotel with a very attentive and friendly staff. I really love how they offered us some takeaway breakfast since we have to leave at 3am in the morning heading to Lovina for our trip. That was awesome..!! Without asking, they really know what their guests needed. The room was huge and clean, the shower pressure are good... The AC working very well.. The breakfast also tasty, maybe not many variance, but all are tasty and you will have your tummy filled up nicely before you go for your tour activity.... Thanks Wina Holiday Hotel..
Eventhough the breakfast start at 7am, the staff kind enough to allow us to take early breakfast at 6am as we need to rush and catch early morning speed boat to Nusa Penida. The breakfast is certified halal. The room is big. We are family with two small children. My husband is local (sumatran) and we have been living in Bali few years back and now that we stay permanent at my home country we still visit Bali almost every year. We have been staying at Wina earlier and we will defenately stay also in the future! Rooms are clean (currently under reno), all the pool areas are also very clean and they have pools for kids too. Staff is always more than friendly and helpful, they genuinly try to help and fulfil all their customers wishes and needs. When we stay here we feel like home. Location is also the best possible. Near to the beach and mall (beachwalk) but still a little bit aside, so thet at the night time it's really quiet and peaceful. There's no other hotel in Kuta I could recommend this strongly for families with small kids and I can say that I have seen the hotel supply in Kuta. Strong recommendation for this hotel from our family! I have been staying at this hotel every yr for 8 yrs now. We love the staff location and pool areas . There are 3 pools now with a additional pool added since we were here last year and it’s fantastic. Our favourite area is the back pool are but we have notice that the pool has become a bit run down in the past couple of yrs.. The rooms in this area need there bathrooms upgraded also. Otherwise this hotel is a 10 on my list. Loayal Travelker to this hotel. Good hotel, breakfast could be a little better. But hard to beat for value in a premium location great access to the beach & shopping. Friendly staff who are always happy to help. Great pool, just a shame you can’t swim in it after 9pm. I have stayed at the Wina several times now and over the years that have elapsed the rooms have become more impressive. Fabulous large, modern and clean rooms, with an outdoor terrace in some of the rooms. Staff as ever friendly and efficient. Location, bang in the heart of Kuta, however set back from the noise. We came back to stay at Wina for the second time and were surprised that they have done a total revamp of the rooms. Toilet were well renovated and staff were as always friendly/helpful. This place is a gem and value for money. Will definitely come back again. This is lovely hotel. Only issues we had were that the bed was very hard. And also we were on a connected room even though we didnt require it. It was very quiet until guests were put next door then we could hear everything they were saying. They weren't being noisy just normal but could here it all. Other than that everything was great. This is our second stay at Wina, the staff and location are what makes this place great. Breakfast was included in our booking and we ate iin the restaurant 5 out of 6 mornings. It has a wide variety of items to choose from including asian, toast, fruit, coffee, tea, juice, egg station, porridge, soup etc. If you purchase each visit it is 60,000 rupiah which is roughly $6 aud. My tip is to have it included in your room price. We had a deluxe and superior room and the deluxe is much bigger with a better fridge. If you can afford the extra $15 night get a deluxe including breakfast. Rooms starting with 1 are ground floor. We will be back again for a 3rd visit in September. 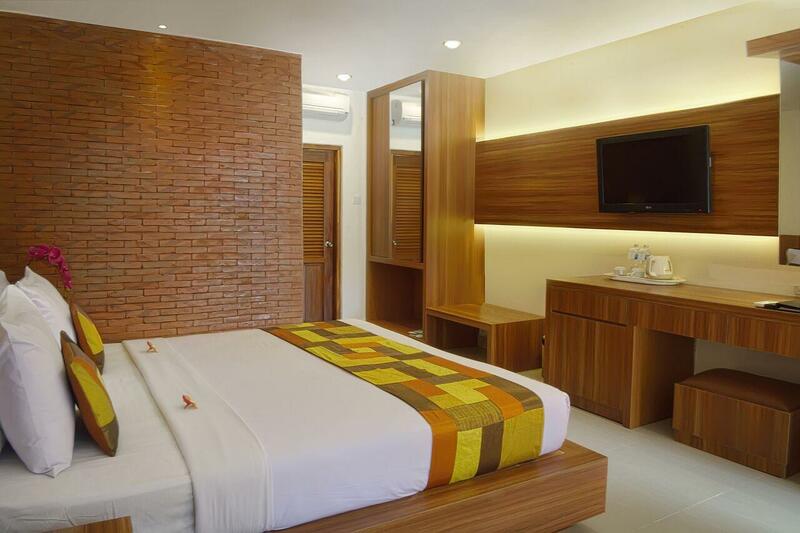 Located at the busy part of Kuta and only 300m from Kuta Beach. However the environment was very peaceful and quite. Just great for a relaxing holiday. The staff were pleasant and helpful. The food at the restaurant was great and price was reasonable. hotel was perfect, breakfast near pool deck but the food are not good for muslim,no choice for muslim people bcos too many pork.Rooms are clean but the aircon need to be open whole day then it will cool...perfer rooms on the ground floor bcos theres no lift for rooms upstairs...have to use the stairs to go up n down...Hotel opposite beach..5mins walking..and closer to shops..and restaurant everywhere..
We stayed from 20dec to 26dec in room 152 & 153. It is a nice (probably less than 3mins) walk down the alley from the main street to the hotel or hotel to the beach. Location of our room was ground floor and pool facing so it is really easy and great for our 3 little kids to jump into the pool. The room was simple and clean. Dont expect a 5* carpeted hotel room. This hotel reminds us of the old kuta some 15 to 20years back when we were in bali during our teens. Back then, this kinda room was considered a luxury. Well, not for fussy travellers. We had an issue on the 1st night after checking in. The air-condition wasn’t working even after we left it on for 4hours. Called the reception and immediately the maintenance guy was sent over to fix it. But a while later, it was just cool air and we couldn’t sleep well that night. The reception was kind enough to upgrade us to a deluxe room but we rejected the offer as we love the room location we were in. So, they sent another maintenance guy again the next morning who took his time to check our rooms and managed to fix the aircon which works well till the end of our stay. Hotel breakfast was HALAL and just nice to fill up the empty tummy in the morning. Love that they have the egg counter so you can request how you want your eggs to be. Breakfast menu changed daily though. We definitely give a 2 thumbs up to their ala carte room service. The black pepper steak was nicely done. Fish and chips plus their chicken wings was awesome too (Minus the tax of cos). Staffs from the reception to the housekeeping to the night security guards who walked around a few times after midnight were all so friendly and warm. We would definitely make a come back and stay at Wina. My stay at Wina Holiday Villa hotel is very good. Everything was well organised and clean with its traditional balistic structures, clean and comfortable beds. Other than that, there are too many mosquitoes and the toilets are not clean.